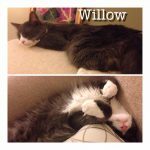 Willow was surrendered as owner could no longer care for. He is 10 months old. An EXTREMLY social boy. He was neutered by Fixed Fur Life and has now been adopted! Shown here settled in his new home. 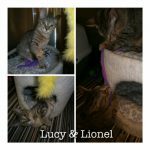 Lucy and Lionel were two of 7 kittens who were living outdoors. 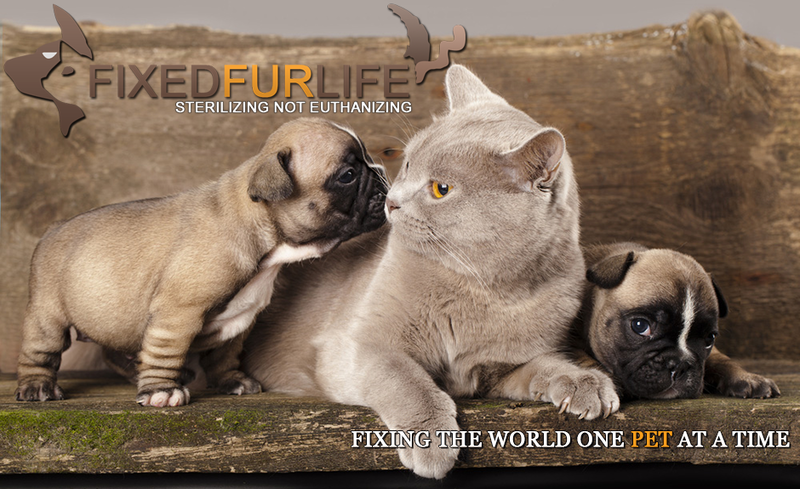 They had to overcome a severe infestation of fleas, worms and an upper respiratory infection. Both have been adopted! 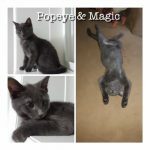 Popeye and Magics pregnant mom was taken in by Fixed Fur Life. She was living outdoors with her last litter and pregnant with another. All were brought to us. All were Spayed and Neutered and adopted. Grace is still presently her last kitten and then she will be spayed. Popeye and Magi shown here have been adopted together! 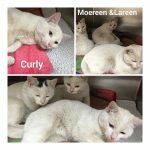 Curly, Moreen and Lareen were rescued from the cold. They were living outside. 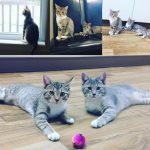 They were Spayed and Neutered v ia FFL and have now been adopted! 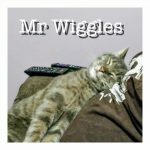 Mr Wiggles came to us a few years back with a severe leg injury that required amputation. He was adopted but just before the holidays his owner passed away. We found him another home. Shown here fitting right in. 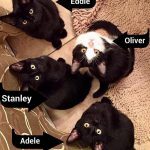 Adele, Stanley, Oliver and Eddie came to Fixed Fur Life as kittens who were tossed outside as they had fleas. Placed in foster care they flourished. All now Spayed and Neutered and have gone onto their new homes! Another Happy Ending. 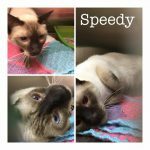 Speedy was an owner surrender. He was not doing well with the busy household he was in . When he came he was upset, growled and was unapproachable. He would lunge at most that tried to soothe him. Despite all this in quiet moments I could see that he would come forward and make an attempt to run against my hands. Many applied to adopt but we chose a home that we knew would suit him best. 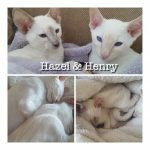 Long story short a wonderful couple who had a quiet home and had had Siamese all their lives came to meet him and fell in love. Update this am is that he is doing well and is soaking in the quiet and loving attention. 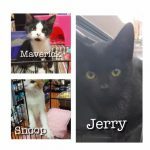 Maverick, Snoop and Jerry all came to us as stray kittens. All have now been adopted! 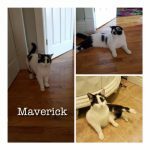 Maverick came to Fixed Fur Life as stray. 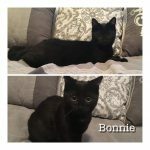 Neutered by Fixed Fur Life he has now been adopted! 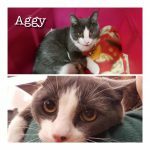 Aggy's owner could no longer care for her. She is a spayed female that was born outside to a pregnant stray. Adopted! 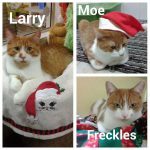 Larry Moe and Freckles came to Fixed Fur Life after being rescued from the cold. All were Spayed and Neutered and all have now been adopted! 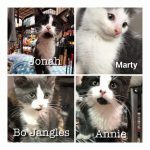 Bo Jangles, Annie, Jonah and Annie all came to us as stray kittens. All have now been adopted! Another Happy Update! 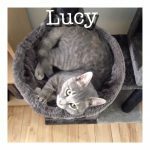 Little Lucy who was taken in from the cold by Fixed Fur Life has now been adopted! Shown here in her new home enjoying her new cat tree! 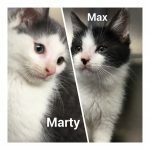 Max and Marty came to us as wee little ones trying to survive on their own out in the cold. Happy to report they have now been adopted! 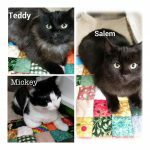 Mickey, Salem and Teddy came to Fixed Fur Life with their mom who had been a pregnant stray. They have all been adopted and mom is now Spayed and she will be available soon for adoption. Jasmine and Jasper ( Now Henry and Hazel) are 11 week old Siamese siblings. Owner was no longer able to care for. Extremely sweet, tiny with big Purrrs. As they were strongly bonded we found a home for them together. 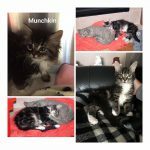 Little Munchkin (now Mi Mi) came to us as a wee baby. She spent many weeks over coming parasites and an upper respiratory infection. She has now gone onto her new home. 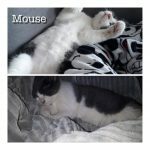 Little Mouses Mom came to us as a pregnant stray. Mouse was the runt of the litter and the quieter of the bunch. Recently adopted he took no time at all to settle into his new home! We rescued Linda and Nancy from a barn population as wee kittens. Look at them now safe and content in their new home!